is as varied as any other modern business, however we have one thing in common: a commitment to maintain the highest standards of workmanship and service possible. As our Mission Statement indicates, this includes on-going, continuous education, taking advantage of all the resources available to us, including classes at Cuesta College, Cal Poly, classes provided through our suppliers, tool manufacturers, independent educators, trade journals, etc. Our goal is to stay current on all new and upcoming technology, as well as hone our skills on current technology. 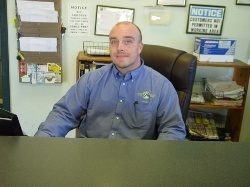 Jesse was originally hired as an assistant to a former service advisor here at Morin Brothers in 2004. 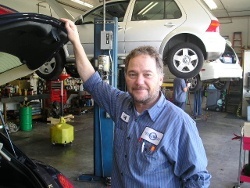 At the time he was working as a detail guy and tire buster at Mike Howe's Automotive in Atascadero. We soon discovered that when left on his own to manage the shop, things went more smoothly and the techs were happier and more productive than ever. Jesse was a "Natural." He has an intuitive sense of how to run a shop and keep the customers and the technicians happy. Jesse's easy going manner and friendly smile puts customers at ease right away, and his "can do" attitude keeps the shop running like a well-oiled machine. Jesse can be depended on to get you in, get it fixed, and get you back on the road in a timely manner and for a fair price. If you've got a problem, Jesse can solve it! Jesse finally decided what he wanted to be when he grew up and bought Morin Brothers Automotive from Michael and Kathleen in January of 2014. So far, he has no regrets. Elena is Jesse’s coworker in the front office. 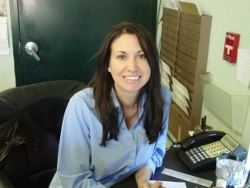 Her cheerful greeting might be your first contact with Morin Brothers, whether on the phone or when you walk in the office. She keeps the guys in the shop on their toes and moving on your car or truck. Elena worked at Freedom Street Rods in Atascadero before coming to help us out, so if you want to lower your Chevy, she can tell you how. Griff McConal is a Scotsman who arrived at Morin Brothers via Texas and Kentucky. He relocated to the Central Coast for the surf, persuading his family that they needed it for the weather! Griff is our talented European Car Technician and we are grateful that he is willing to tackle the mysteries of European engineering. Ron Prescott is Morin Bros. go-to guy for just about everything. He opens the shop in the morning, gives customers rides, maintains the shop’s sparkling appearance, performs routine car maintenance, and handles our full service detail and car wash bay. 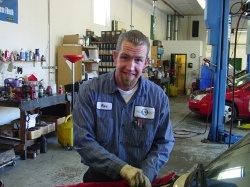 His can-do attitude and friendly smile make him fun to work with and a real asset to the shop. 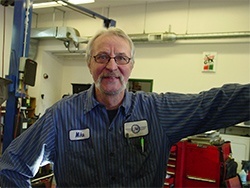 Michael has made his living as a mechanic, technician and shop owner in San Luis Obispo since 1973 when he went to work for Pacific Motor Imports, a Fiat, SAAB, and Citroen dealer located where Valley Mazda is now. After brief visits to Britannica Motors (now XK's Unlimited) and The Bus Stop (now European Auto Service) he and his brother Pete opened Morin Brothers Foreign Automotive on McMillan Ave in 1981. Pete went on to pursue a career in music (Blue Note Music in the Creamery on Higuera) when Michael bought him out in 1991 and is now semi-retired. Michael is a National Institute of Automotive Service Excellence "Master Automobile Technician", holds a California Smog License, is a member of the Society of Automotive Technicians (a sub group of SAE), and is a member of the online iATN - international Automotive Technician Network. Running the business was a full time job for Michael, but now he only works two days a week and spends the rest of his time traveling and playing in his woodworking shop. Michael is married to Kathleen. They live and play in Atascadero with Lennie and Gerti, the Diagnostic Duo. Freida was our official greeter and ambassador of goodwill. She assisted us in all our chores, and was especially good at lending a hand with the occasional thorny automotive problem by fetching the ball, begging for biscuits, and searching for "the red dot". She was a pound pup and has been with us since February of '99. Rumor has it that she was a "Beagle - Greyhound" cross (can you picture it?). 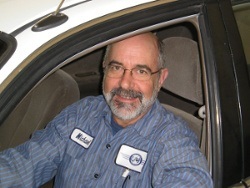 Mike Schadan has worked for us twice before in the last thirty years and came back to stay in November. No, we haven’t been mistreating him. Both times he left us in the past he had an “offer he couldn’t refuse”. When he came to us this time we were the ones making the offer! 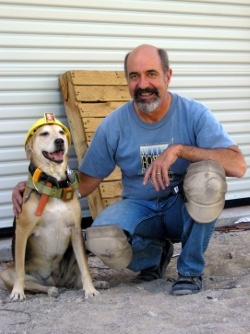 Mike has lived and worked in the San Luis Obispo area for most of his life. His most recent stints included Pete’s Automotive in Morro Bay and Cuesta Cadillac-SAAB (now Rancho Grande Motors). At Cuesta he was senior SAAB tech and the beneficiary of many hours of factory training. He carried on with his SAAB work at Pete’s, and now is our resident SAAB tech. Mike has owned as many as six SAAB’s but is now down to only three.